2016 was a down year for the Sanchez Sharks football program, who’ve won three football titles in the past decade. An apparent issue last season was the amount of Sharks on the roster, with many players having to run on both sides of the ball all-game-long. 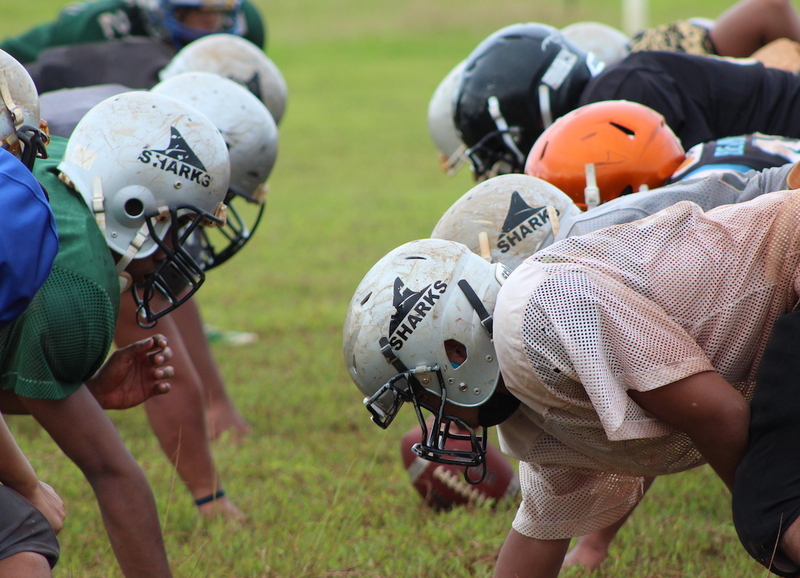 2017 looks to be a fresh start for the Sharks who are welcoming a good batch of underclassmen in hopes to revitalize the once power houses of the IIAAG under coach Jimmy Naholowaa and his committed staff, which includes Andre Artero and Ron “Mike” Robang. A few returnees, like All-Island selectee tackle Kanoa Nahoolewa, will be anchoring the line while their new players will fill up their skill positions. The infamous Naholowaa wish-bone offense has a few new pieces to work with in the form of sophomore football twins Kameo and Kamerin Toves, who were star players for the Saints in the GNYFF. The twins will be looking to bring new energy to the team, much like they did in the youth league. “Win or lose, we’re going to bring the same type of energy because we’re always going to try and have fun. A strength of the team is in our communication and knowing we’re working hard for each other,” said Kameo. Kameo will be on both sides of the ball playing fullback and linebacker, a different pace to his usual time playing running back for the Saints. “Since this is high school, I’m looking forward to hitting the big guys,” laughed Kameo on taking up new positions. “I hope to get recognized and hopefully start in building my way towards playing college football,” added Kameo. If one dynamic Toves wasn’t enough, another will be emerging from the backfield for the Sharks in the form of Kamerin Toves. The best part of Kam’s gig is knowing that his lead blocker has been on his team since birth. “Having him out there with me is going to be awesome just knowing that he has my back and I have his,” said Kam. Kam played a wealth of running back in the youth league and he feels the training he’s been putting in will help him succeed. “I know high school is going to be a lot different, but I’ve put in a lot of work and I know I’m stronger and faster than I was back in youth football. I’m looking forward to showing what I can do,” added Kam. Along with ushering a new era, the Toves twins are confident that they could help the team with their recent scoring and winning woes. Quarterbacking the Sharks will be junior Patrick Salas. Along with football coaching knowledge, Jimmy Naholowaa also has the voice projection to be heard from anywhere on the field. The veterans are used to it, but some of the new-comers needed a time to adjust to Naholwoaa’s booming coaching personality. “It’s more tough than any coach I’ve had before, but you have to just deal with it. You have to put your pride away and understand he’s coaching to better you,” said Kam. The Sharks welcome the Southern Dolphins up north on kickoff night at the Okkodo Field at 7 pm Friday!